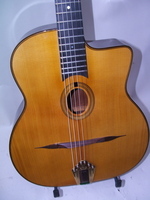 [url=http://www.djangobooks.com/archives/2006/02/21/1024/Favino1024.htm]My Favino[/url] has a prettier, more balanced sound. Better for recording, rhythm, and more modern sounding stuff. But for sheer Gypsy shredding the VR wins the day. I don't suppose this means the Favino is going up on the block, by any chance? Hey Jack....I'm going to hang on to both guitars for a while. At some point I'll probably sell one of them. It'll be fun figuring out which! I have an older (1993) Dupont, solid maple (MD-20) that I think has killer tone. Maurice (and his crew) build some awesome guitars. Not all of them are wonderful, however. Buyer beware. 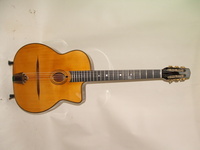 Every guitar made by JP Favino has wowed me (that I have played), but I have played some of his fathers guitars that left me cold. Acoustic guitars are a strange thing. Each is as different as the wood the are made out of. 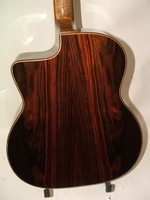 Even when made by the same company or luthier. When you find one you like, keep it. Thanks Marc...did you play my Fav at Djangofest? I don't remember. The Gibson you lent Robin was awesome...that guitar really suited him well. 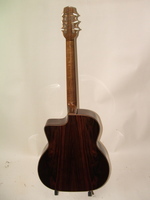 Re: Henning Doderer's acoustic bass: Acoustic Guitar several years ago had a feature on Doderer's acoustic bass. And recently in the 6 August 2013 issue, they did an article on Doderer's then new "Honey Bee" guitar. He's a well-respected luthier in Germany.